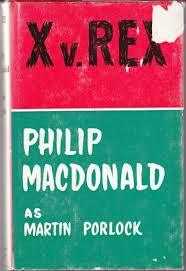 Philip MacDonald, although this book was originally published as by “Martin Porlock”. Philip MacDonald was a well-known Golden Age writer who came to prominence with a clever book called The Rasp, in 1924. This 1933 volume qualifies as a Golden Age mystery; second under “L”, “Read a book that has been made into a movie.” This qualifies twice: The Mystery of Mr. X in 1934 and The Hour of 13 in 1952. Even so simple a question has a complicated answer here. 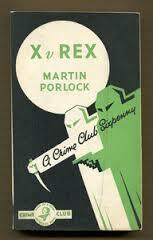 This book was originally published in 1933 in the UK as X v Rex as by “Martin Porlock”. It has been suggested that it was later published as The Mystery of Mr. X under the author’s best-known name of Philip MacDonald, which would probably be some kind of movie tie-in edition (see above), but I am wholly unable to confirm this and I advise my readers to take good care before quoting me. It has certainly been published as the edition at the top of this post and numerous others in the United States as Mystery of the Dead Police as by Philip MacDonald. The edition shown above is Pocket Books #90 from 1940 which I believe is the first U.S. paper edition. Most publications these days appear to have stabilized as Mystery of the Dead Police, perhaps because most new editions are American. MacDonald seemed to have an affinity for the letter “X”; his publishers seemed to have a positive delight in changing the titles of his books. You should be aware that this book has nothing to do with Warrant for X, another MacDonald book/film property that I’ve addressed here; I have more to say about MacDonald and his work there. Standard spoiler warning: What you are about to read is likely to discuss in explicit terms the solution to a murder mystery. Please read no further if you wish to preserve your ignorance of its details. You will also probably find here discussions of the content of other murder mysteries, perhaps by other authors, and a similar warning should apply. From the standpoint of 2014, it’s hard to remember a time when there wasn’t really such a thing as a “serial killer” plot. We are currently inundated by them, to the tune of a couple of prime-time television programmes, dozens of films, and enough good and bad novels to sink a yacht. Back in the day, though, before the term “serial killer” was invented — Wikipedia is not entirely sure, but the English-language phrase is “commonly attributed to … the 1970s” — we had novels and films about concepts like “psycho killer”, “Jack the Ripper”, “blood lust”, etc. I believe you’ll agree with me that the concept first became cemented in the language because of the activities of Jack the Ripper. No one really wrote a lot of fiction about Jack the Ripper (barring Mrs. Belloc Lowndes’ The Lodger in 1913) and relatively few people wrote novels about “lust murderers” until about the time of this novel (1933). 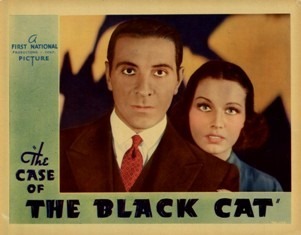 By 1936, upon the publication of Agatha Christie’s The A.B.C. Murders, the concept had become solidified sufficiently to be the subject of one of Christie’s famous twists. But in 1933, there was a clean patch of untrodden snow upon which writers were free to scrawl whatever they wished. So it is difficult from the modern perspective to write about these books because the people who wrote them and read them had a different set of words they used in order to categorize them. It’s hard to trace the development of the serial killer novel back into a time when there was no such thing. In 1933, although as I’ve said such themes were not common, there was an occasional novel about the activities of an insane person who commits a series of crimes for what seems to the reader to be an insane reason. The course of the novel is something like a modern procedural, where we see the activities of crime fighters attempting to (a) figure out the linking theme that governs the killer’s choice of victims, and/or (b) use knowledge about the killer (including an awareness of that linking theme) in order to predict the next victim and thus intervene and capture the killer. 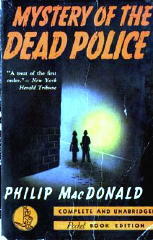 Philip MacDonald apparently enjoyed this theme sufficiently to write at least two similar novels, Murder Gone Mad and Mystery of the Dead Police. Both are about a series of violent murders committed by an individual who is insane, as above. In Murder Gone Mad (I don’t have a copy in front of me) it’s random members of a small British town, and the killer is someone who is concealing their madness and functioning quite well. In Mystery of the Dead Police it’s uniformed police officers, and the killer is less completely functional. The first such murder takes place in the small town of Farnley; someone fakes a burglary call at the local manor and, when all active constables are called out, someone enters the police station and kills the desk officer. After that, the scene of the crimes moves to London, where someone is killing an on-duty officer every couple of days. The tension mounts over the course of the novel until Scotland Yard forms an alliance with a consultant, Nicholas Revel, to trap Mr. X and bring him to justice. In the next while, Revel uses this entree to Vayle and thereby to Jane Frensham in order to seduce Jane and meet her father socially. Since everyone in London is mesmerized by the Mr. X killings, Sir Horace is entirely consumed by the case and looking for suggestions; Revel piques his interest. It seems also as though Revel is planning some kind of criminal act but the details are certainly not clear, nor even is Revel guaranteed to be participating. We are told about the activities of a gentlemen who is extremely carefully disguised as a down-on-his-luck clubman, who gets together with other lowlifes in pubs and talks about … something. But we’re not guaranteed at any point that Revel is in disguise, merely that someone is. Sporadically through the book, we have also been given the ramblings of the killer himself, writing in a journal. We learn something about why he does what he does, and certainly a lot about how, but we don’t have enough information to identify him or precisely why he has selected policemen as his victims. It becomes clear that the killer is, in modern terms, decompensating mentally, and stepping up the level and violence of his murders. Revel makes a number of suggestions that Sir Horace finds very useful in the hunt for Mr. X. It seems to be that the unspecified crime to be committed by the disguised man is not going to be committed, unless the activities of Mr. X cease. Meanwhile — and this is a significant theme in the book — Vayle realizes that Jane has fallen in love with Revel and reacts very badly, threatening violence to Revel and creating social contretemps. Jane comes to understand that she has fallen for Revel; Sir Horace doesn’t quite understand what’s going on but will allow Jane to make her own choices, it seems. Revel and Sir Horace set a trap for the killer, using Vayle as the figure of the policeman who is the bait. Together they trap the killer, arrest him, and find his diary, proving beyond doubt the identity of Mr. X. In something of a reversal of the reader’s expectations, we learn tangentially that a large robbery has taken place; Revel leaves town and Jane reunites with Vayle. Revel is last heard of when he sends them a wedding present. Mystery of the Dead Police would be a significant book even if it were only an early example of the modern serial killer novel. It’s fascinating to follow the development of the theme over the decades; at this point, the killer is “insane” and his actions cannot be predicted or even more than barely logical. In the 1950s, there was a growing awareness that some such murderers in real life, like the Boston Strangler, were motivated by some twisted sexual motive. And in the 70s and beyond, of course, the modern serial killer might be represented by Hannibal Lecter; a brilliantly insane figure who has rejected the ability of society to control his actions. But this is 1933, and thinking has only gone as far as imagining that the series of murders is committed by an insane person for a relatively inexplicable reason. There’s another reason to source this book and enjoy it for yourself; it is really very well written, and one of its strengths is that it’s an example of a writer striking out, trying to find new forms and ways of telling a story. E. C. Bentley’s Trent’s Last Case (1913) contains a section near the beginning where the world’s newspapers are seen to react to the death of industrialist Sigsbee Manderson in a series of headlines, which was quite innovative for its day. This volume contains segments where the reactions of various levels of society to the activities of Mr. X are displayed in brief paragraphs, mainly for the amusement of the reader. 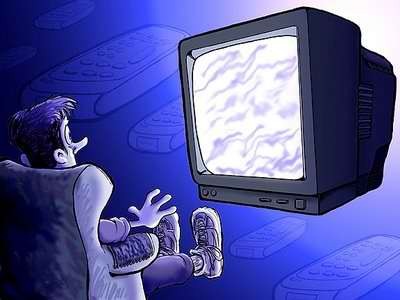 For instance, chapter 22 consists of small segments each from a different point of view. The first segment explains that every segment of society is concerned about Mr. X; Mr. X writes a letter to the newspapers and everyone reacts. The next segments are from the point of view, respectively, of Sir Horace, the Prime Minister, Mrs. Rawle of 14 Laburnum Road, Upper Sydenham, a General at the War Office, a couple of Mr. Revel’s henchmen, a superintendent of police under Sir Horace, Mr. X himself, three rank-and-file policemen, and finally Sir Hector again. Each segment is merely a few paragraphs long, more or less; characters like Mrs. Rawle are not so much introduced as allowed to speak characteristically for a few moments, then vanish from the novel. I think of this technique as being an early precursor of what I call “intensively recomplicated” genre novels like, say, John Brunner’s The Jagged Orbit (a dystopian science fiction novel of 1969) where the narrative is multi-stranded and some main characters never encounter each other. It is used to show various types of people reacting to a central event or trend, in this case interracial disharmony in the United States of — exactly 2014, which as I write on New Year’s Day 2014 doesn’t seem so far from reality! Anyway, Brunner was nominated for the Nebula for this novel, and deservedly so. But without the early efforts of writers like MacDonald, this method of storytelling wouldn’t have been possible. This book was first filmed, in a fairly faithful rendition of the two plots if not the recomplicated structure, a year later. 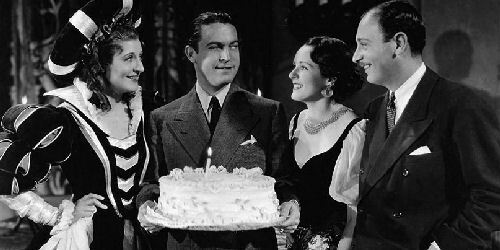 It stars Robert Montgomery as Nicholas Revel, Elizabeth Allan as Jane, Henry Stephenson as Sir Horace Frensham and Lewis Stone, the garrulous Cockney cab-driver who plays a major role. 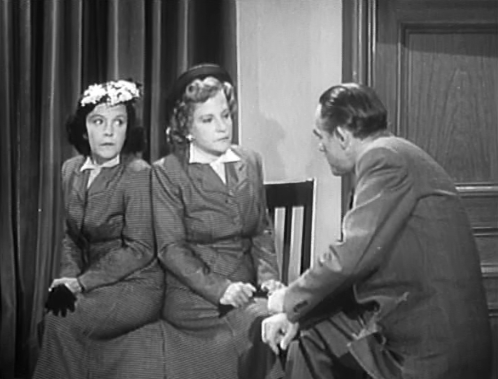 The film’s equivalent of Christopher Vayle is played by Ralph Forbes, and Leonard Mudie is seen briefly as Mr. X. Although I’ve sourced a copy of The Hour of 13 and it is on its way, I haven’t screened it in time for this to be my first post of 2014. I may return to this in the future and update this, if there’s anything truly significant about the remake. 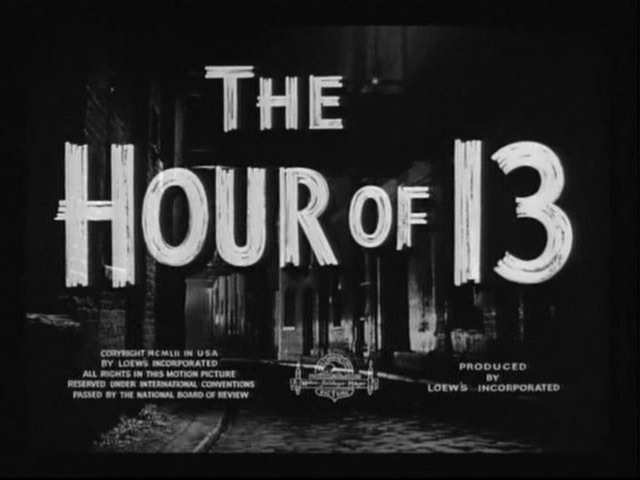 January 15, 2014: I’ve now screened The Hour of 13 (1952) a couple of times and thought I’d make a note of it. This may sound paradoxical, but what’s significant is that this movie is very nearly an identical remake of The Mystery of Mr. X except for the cast, and one unusual change; the time period has changed to what might be 1890. The garrulous Cockney cab-driver’s cab is drawn by a horse, for instance. I can’t think of why they would have arbitrarily changed the period. This must have been expensive in sets, costumes and props. It might be that the film company had just done an Edwardian production and found this convenient. Peter Lawford may have wanted to go all costume on us. Who knows? Peter Lawford is Nicholas Revel, Dawn Addams is Jane Frensham, Michael Hordern is a wonderful Sir “Herbert” Frensham, Derek Bond as this film’s equivalent of Christopher Vayle. There are minor changes here and there between the filmed versions, but the two are remarkably equivalent — except The Hour of 13 is slightly easier to follow, because they’ve added a scene or two that makes it clear how Peter Lawford’s character works as a jewel thief and just what the stakes are. I haven’t gone to the trouble of comparing exactly, but the climactic scene where Nicholas Revel and Mr. X are battling in an abandoned factory, or some similar building, appears to have been filmed on exactly the same set and even with exactly the same fight sequence, the same desperate scramble not to be decapitated by an elevator car, etc. Peter Lawford is quite charismatic but not up to Robert Montgomery’s high standard. The film overall is uninspired — the acting in general is not convincing and there is an air of dull melodrama throughout — but the studio has given it full value in sets, costumes, etc. This novel has been in print for quite a bit of its long life; it was selected as #19 of the Dell Great Mystery Library in the late 1950s. The copy I read for this review is, as is my habit, pictured at the very top of this piece; it is a copy of Pocket #70 from 1940. A Near Fine copy on Abe is today selling for $40. A Canadian bookseller with more enthusiasm than realism wants $75 for a copy of the 1973 re-issue of the original Collins Crime Club edition, titled X v. Rex as by “Martin Porlock”, and insists that it is scarce; $75 will also get you a copy of the first US edition from Doubleday in 1933, Very Good in an ordinary jacket. I know which one I’d prefer for my $75. The true first can be found on viaLibri for $99 in VG shape; a copy of the beautiful first paper edition, Collins White Circle, London, 1939, tenth edition in the scarce dust jacket (seen just above, with the standard “two hooded criminals” cover), will set you back $50. And, of course, there are the usual wacky prices and editions from sources such as eBay and Amazon, mostly, as noted above, from vendors with more enthusiasm than realism. 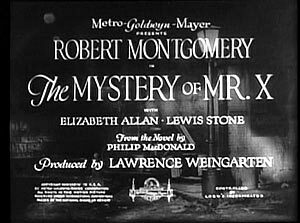 I don’t see copies of Mystery of Mr. X on Amazon but TCM shows it on an irregular basis. You can get a copy of Hour of 13 for $17.96 from Amazon today. If I were buying a paper copy of this novel to lay down for the future, I think I might look for a pristine copy of the Collins White Circle edition with jacket, even over the early Pocket edition; the British edition is much more visually interesting than the muddy Pocket cover. If the true first is within your reach, by all means, get what you can afford; this is a fairly important book and will appreciate in the future.